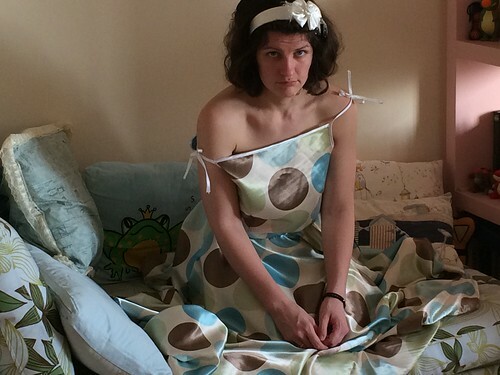 t*rexes and tiaras: Mad Men Sewing Challenge.. 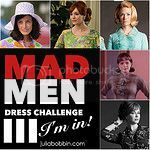 When I saw that Julia Bobbin was running a Mad Men inspired sewing challenge, I couldn't wait to get involved. As soon as I saw it, I knew which dress I wanted to use as my inspiration. I've only watched the first four seasons of Mad Men, but this polka dot dress of Betty's is probably my favourite outfit of all of the episodes I've seen. By a long way. (Also, I sort of want to be sulky Betty, as I think she's awesome, not just for the fact that she gets to share a bed with Don - jealous!). So, it was on to the fabric hunt. Although I have been trying hard to use up what fabric I already have in the stash, I've been buying approx. 2.5m of everything lately, which I knew wasn't going to be enough for the long, full-skirted number I had in mind. 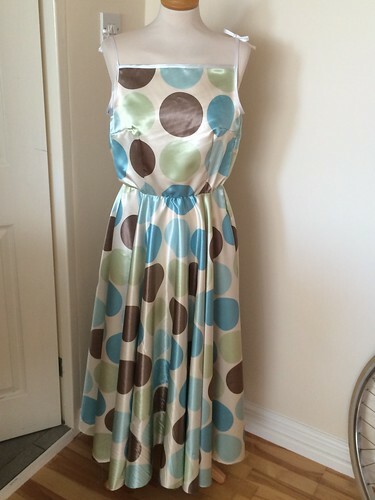 I managed to find this cream polka dot Dupiaza satin on eBay for around £5/m and I bought 5m, just in case. Mostly because I'd not quite decided what pattern I'd be using.In the end I only used about 3.5m but it's better to be safe than sorry. In the end, after searching through most of the pattern websites to find something similar enough, I decided that I could actually use this Butterick B4513, which I've made before, but not for a while. I purchased some satin bias binding for the neck and armhole edges and the straps and set to work. I'd been a little wary of working with satin, which was new to me, but I actually didn't have any problems with it, other than the fact that I probably used elastic which was a little too wide for the waistband, so trying to insert that into the channel (which I didn't want to fray, so had probably stitched a little further away from the raw edges than I usually would, which won't have helped either) was a little tricky. Other than that, no issues with this make, other than the fact that I probably should redraft the bodice to fit me a little better. That didn't really matter too much for this photo, as I wanted to wear the straps off the shoulder like in the Betty pic, and practiced my best pouty sulking face for my own version of the picture. In all likelihood, I will probably take the hem of this dress up a little before I wear it for real. I think it will be that little bit less "formal occasion only", if I do. I really like the way it turned out, though. Aww, thank you - I had lots of fun doing this actually, I'm definitely going to see if there are other challenges I can join in with! Oh Char, I love this SO MUCH. Especially the recreation of Betty's pose! Amazing! aww, thanks, I felt a bit silly in this picture but it was the most like the top one that I could find. Thanks, I think I lucked out with the fabric. Haha, it's a long time since my hair was that short! Great dress and fab picture too. To make it really 50s you need a net petticoat underneath...I love it though! Great dress! Teamed with your best Betty-Sulkface it's perfect! Aw, thank you very much. I had so much fun making it and taking the photos.